Hello everyone! Samuel Dedman here, your returning VP Education for 2018/19. 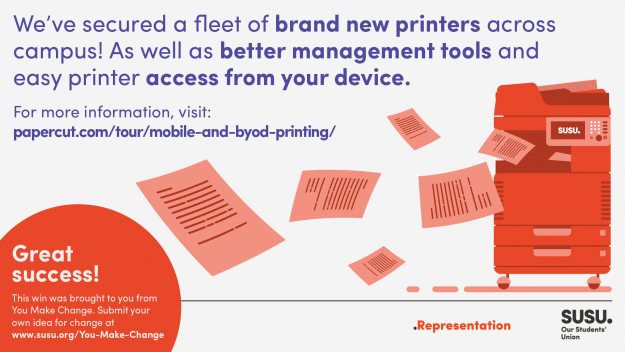 Over the past year the Students’ Union have been working hard to improve the printing experience across the University of Southampton. As I mentioned previously the University recently went out to tender for a new Managed Print Service provider – a process which I have been involved in throughout the past 12 months. We’ve had to keep a lot of the good news under wraps for a few months now, but as of June 2018 Apogee (the new provider) are now underway with the roll-out of their service at the institution. iSolutions have released a series of guides for using the new printers, which can be found here. Now the eagle-eyed of you will have noticed that there has been no mention of price thus far. We are continuing to work with Apogee and iSolutions to agree when this information can be released, and you’ll be the first to know once we have access to it. Thank you to both parties for their support up until now, and for taking student feedback on in these negotiations. Keep an eye out for the new printers around our campuses very soon, and don’t hesitate to get in touch if you have any questions!